In modern day era, when digitalization is reaching its adulthood, the technology is changing how we interact with our environment. We have gone full digital – making payments online, reading online news, creating and sharing digital documents across all devices. All that data can be shared in one single digital encoding that we know as a PDF. The PDF – portable document file – is the technology that enables us to have fully digital documents that we can read and share easily. Because of the PDF structure, the data contained in it will look the same on every device and operating system. The everyday users use it to read eBooks, lectures and research papers. More and more business-oriented people tend to send invoices, contracts and other legal documents in a PDF. Even job seekers tend to send resume in a PDF form, in order to be sure that their first contact with potential employer will be the best-looking. We can see how we have adopted wide usage of the PDFs. But there is a certain downside when you work with PDF documents on a daily basis. It can be hardly edited at all. Why should you convert PDF to Word? With that being said, there is a hardly ideal solution for editing PDF because of its read-only nature. When you want to send your old resume to an employer, it would be a good idea to update the info about your newly acquired skills or working experience before sending it. Or just filling in a legal form or contract with your basic information, you can’t do that on a PDF file. A perfect document type for editing and text files would be a completely editable MS Word document. This is the most popular document type for writing and creating new documents. Given that rewriting the resume from scratch is not an option, you might consider using PDF to Word Converter app, to make your resume editable again. And you can do all that while on the go with PDF to Word app. 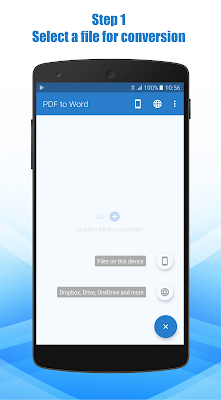 What can PDF to Word Converter do? The thing I find most useful is that it only requires few simple steps to convert a file. 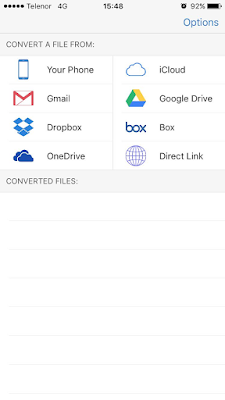 As mentioned before, you would just need to follow 3 simple steps to convert any PDF with this app. There are two options for uploading the document, either from your device or from cloud services like Google Drive, Onedrive, Dropbox and others. You can access the data on your cloud accounts directly from the app by entering your login data. The conversion itself is performed on the servers where the files are automatically uploaded, converted and then sent to the app. The files are deleted from the conversion servers automatically after the process is completed. The conversion time may vary, depending on the size of the PDF and complexity of the file. After the conversion is finished and the file is ready for the use, you will receive the notification. Once the conversion is done, then you can start a real work of actually editing the parts of the file that you couldn’t do before. You can edit the file directly on your phone with the mobile app like MS Word or Google Docs.